Reference: Mant J, Hobbs FD, Fletcher K, et al. Warfarin versus aspirin for stroke prevention in an elderly community population with atrial fibrillation (the Birmingham Atrial Fibrillation Treatment of the Aged Study, BAFTA): a randomised controlled trial. Lancet. 2007 Aug 11;370(9586):493-503. The BAFTA (Birmingham Atrial Fibrillation Treatment of the Aged Study) randomly allocated 973 elderly (75 years or older) patient with atrial fibrillation to warfarin (INR target 2.5) or aspirin (75mg/d). Warfarin was more than twice as effective at preventing strokes – including hemorrhagic stroke (1.6%/yr vs 3.4%/yr) and warfarin did not cause more major bleeding (1.4%/yr vs 1.6%/yr). Although major bleeding increased with age, the major bleeding rate in the 85 and older group was actually lower with warfarin (2.9%/yr) than with aspirin (3.7%/yr) (not statistically significant). The number needed to treat for one year to prevent a major event was 50 (major event = fatal or disabling stroke, intracranial hemorrhage, or clinically significant arterial embolism). The patients in Hylek's study were a non-select group from an anticoagulation clinic while the BAFTA patients were criteria-selected patients with atrial fibrillation. Patients with a recent bleed, certain bleeding risk factors, and/or hypertension were excluded from the BAFTA study. The INR control (67% in-range) was better in the BAFTA study than in the Hylek report (58%). A recent analysis of the SPORTIF trials would suggest that this difference in INR control is likely to be associated with a significant difference in bleeding risk (see http://www.clotcare.com/clotcare/improveinrcontrol.aspx). Over one-half of the major bleeds in the Hylek report occurred with the INR above 3 and about one-third occurred at an INR above 4. Approximately 40% of patients in Hylek's report were taking concomitant antiplatelet therapy. In the BAFTA, platelet therapy was not listed as an exclusion criterian but neither were data provided on the concomitant use of antiplatelet therapy with warfarin. 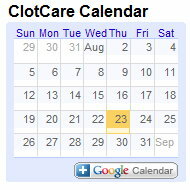 Kucher, and colleagues recently reported that the incidence of major bleeding had been increasing in their population and attributed the increase in part to the increased use of antiplatelet agents with warfarin (especially in stent patients) and higher rates of hypertension (see http://www.clotcare.com/clotcare/warfarinbleeding.aspx). The BAFTA trial, however, found no such increase in bleeding among those new to warfarin. The BAFTA authors also addressed an individual patient meta-analysis of elderly patients in several A. Fib studies that compared warfarin vs. aspirin. In that meta-analysis, the reduction in stroke was similar to that reported in BAFTA but the incidence of major bleeding was almost twice as great with warfarin. The BAFTA investigators point out that several of the A. Fib studies in the meta-analysis (SPAF II, AFASAK, and EAFT) had target INR ranges as high as 4 or greater. In fact, patients in the SPAF II study had a substantially higher major bleeding rate and, based on the ISI values for the thromboplastins employed by their laboratories, the target INR range in some locations may have been as high as 5.2. (1) In addition, SPAF II investigators recommended acetaminophen or disalcid as their analgesics of choice; drugs now known to interact with warfarin and increase the INR. Therefore, it would appear that warfarin can be used very safely and effectively in the elderly population with atrial fibrillation if bleeding risk factors are carefully considered and controlled and if the INR is well maintained. 1. Bussey HI, Force RW, Bianco TM, Leonard AD. Reliance on Prothrombin Time Ratios Causes Significant Errors in Anticoagulation Therapy. Arch Intern Med. 1992 Feb;152(2):278-82.